When we look back on the early decades of the 21st century, the development of the ecological movement from being a niche concern to a mainstream way of thinking will certainly stand out as being one of humanity’s most significant shifts. Over the last decade an a half, ecological advocacy has moved beyond the altruistic rhetoric of “helping the planet” to demonstrating that the activities of humans are inseparable from and dependent upon healthy ecosystems. The result has been an increasing number of pragmatic victories. As part of this shift, a core frame of reference that’s become more and more widespread is the understanding that ecological systems are not simply equal to human systems, as the three-legged stool of economy, ecology, and culture would imply. Rather, ecological systems are foundational to human systems. In the grand scheme of life on this planet, economy and culture do not exist without healthy ecological systems. Therefore, ecological systems must be regenerated—and protected—at all costs. This has become increasingly self-evident to our leaders, activists, and change agents. 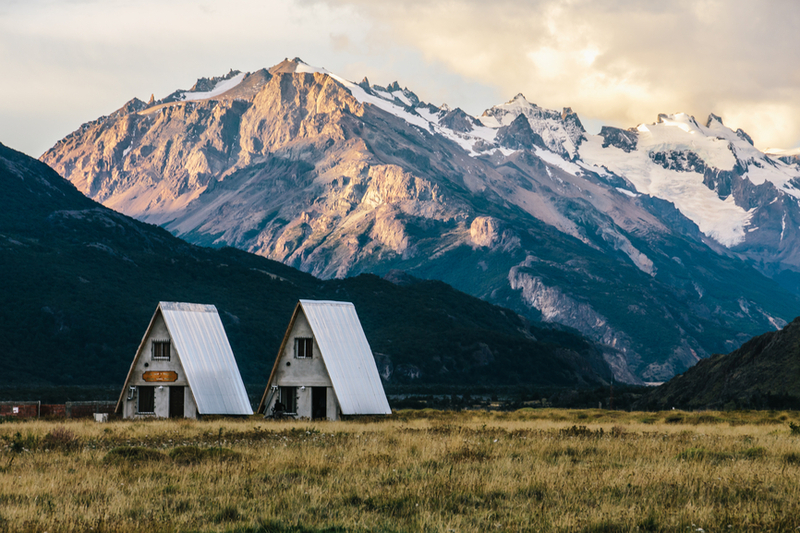 Ecological systems provide the basic building blocks of human sustenance and the resources for our many economic endeavors as well as mitigate the climatological forces that we are now increasingly being affected by. In communities around the world, “wealthy” neighborhoods are defined by their ecological assets—think riverfront properties, mountain estates, and beach houses—as much as they are by their human-created ones. Similarly, impoverished communities all over the world lack not only financial resources but also greenery, wildlife, and healthy bodies of water. As this understanding becomes more widespread, humans are able to drum up the will to intervene in processes of ecological degradation at larger and larger scales. For example, in dealing with systemic poverty and natural disaster vulnerability in Haiti, members of the ecological movement have long identified the massive deforestation of 98% of Haiti’s land, which began in the nation’s colonial period, as a key originating factor. Not only is Haiti’s poverty directly linked to this deforestation, which renders many of its citizens unable to participate in even a basic subsistence economy, but the natural disasters that have killed hundreds of thousands of Haitians might have played out very differently if the nation’s once lush, absorbent tropical rainforest were in place to slow storm surges and mitigate flooding. Recognizing this, numerous small aid organizations have been spearheading efforts to plant trees in Haiti for nearly 30 years—but the impact of these combined efforts has been minimal. But just two years ago the Haitian government came around to the necessity of this approach, committing to plant millions of trees with the goal of increasing the nation’s forest cover to 4.5% by 2016, 8-10% by 2023, and 29% by 2063. The restoration of the ecological systems that would be so foundational to Haiti’s health is no longer an impossible dream, but an unfolding reality. The shift from seeing ecosystems as being merely useful to humans to seeing them as being foundational is an important one—it’s a shift that myself and my colleagues at Regenesis have been working, along with so many others in the world, to enable. From biomimicry to permaculture, the idea of nature as the master designer, the highest authority, and the ideal source of all inspiration has begun to promulgate. But this mindset implies a sort of hierarchy, in which nature occupies the highest rank, and humanity sits below it. And while the existence of that hierarchy, which is indisputably present and observable in the natural world, is something that inspires wonder and creativity and the will to change things in our places and in the world, the truth is that it’s only half the story. In order to see the other side of the story, we need to look a little bit closer at how the hierarchy is actually constructed. When the average person thinks about ecological systems, the first thing that comes to mind is usually a constellation of plants and animals. I think of the piñon, juniper, jackrabbit and coyote of the high-desert Southwest, where I live. But ecological systems are even more complex than those brilliant communities of plants and animals. The foundational layer of the ecological world is not biology but geology—the billion-year-old land formations that define, at their very bones, the world’s places as we know them. This geology, formed initially by the mammoth processes of volcanic eruption and tectonic upheaval, is actually still being formed today, in ultra-slow motion. These geologic systems—the world’s mountains and valleys, its plains and deltas—are the underlying framework upon which the second layer of the living world is built: the hydrologic layer. This includes not only the pooling of water into the world’s rivers, streams, oceans and floodplains, but also the climatological portion of the hydrologic cycle—the gathering of moisture into the air and its behavior once it gets there, as it takes its cues from the land masses beneath. It is onto these two layers–the determiners of landform, elevation, water and climate—that biology organizes itself. The distinct communities of plants and animals that aggregate in a particular place evolve in response to these very real conditions. Within even a single forest, changes in these conditions will invite distinct micro-communities of species to thrive. An observant person on a long hike can experience the transitions between these patchwork systems—this is the experience of cresting a hill to find the slope below to be suddenly littered with wildflowers, of stumbling into a thick patch of wild berries, or of breaking above the Ponderosa line on a mountain. 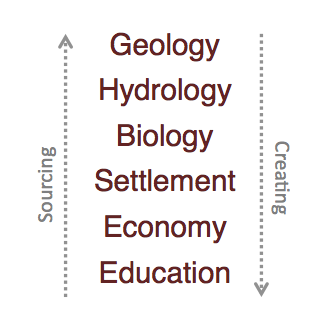 This is an ecological system—geology, hydrology, and biology. But the layering is not complete. 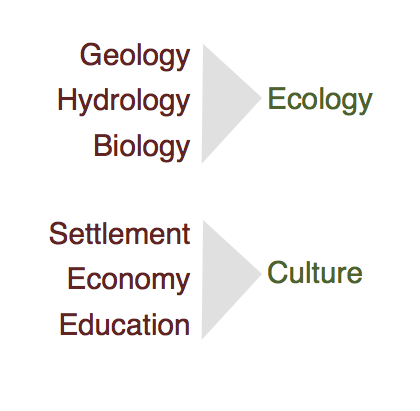 Upon these ecological systems, human cultural systems grow. First, we see the layer of settlement. When humans were nomadic, we functioned like everyone else in the biological layer—but once we began to settle, to build homes, and to plant crops, we created a layer unto itself. Just as hydrology is determined by geology, these settlement patterns are indicated by the ecological system—the availability of fresh water, fertile soil, and good hunting in the earlier days of humanity and of beautiful views and recreation opportunities in the present. The second layer of human culture, built upon and indicated by all of the layers beneath it, is economy. These villages began to accumulate resources, and sought to trade with other outposts whose own resources were complementary. Our economies are still based on these natural resources and on our ability to set up shop where they are located, even as we’ve massively complexified, and distorted, our connection to and interface with those resources as well as the layers of additional, human-created resources that we now also utilize. From these economies developed our approaches to education—our intention to hand down some information, some understanding, of how best to earn a livelihood in and do right by a place. human wealth, cultural richness, and spiritual purpose. That source is the natural world, and it always has been. In reclaiming our recognition of this source, we have taken the first step to becoming, once again after many years of having lost our way, indigenous to our places. But there is a second hierarchy, one that we are largely attempting to disown as it pertains to our role in the natural world. We might call this the hierarchy of creating. Upon geology, bodies of water are created. Upon wet soil, biological life was created. Upon these ecosystems, human cultures were created. But each layer was not only created, but also creative. Plants and animals interact not only with the water systems that enable their existence but with one another—feeding, pollinating, fertilizing—to create new life and evolve. Human communities and economies are the same. As you move up the hierarchy of creating, each layer becomes more complex, more abundant, and holds greater potential. A valley filled with rocks and rocks alone may very well be beautiful, but it’s not alive. As the layers of hydrology, biology, and culture form, life takes root and takes off. It is, at this point of understanding, that our role is called into question. Human creativity is not a new concept, but much of what we’ve been creating and how we’ve been creating it has been damaging our foundation, depleting and degrading and tearing away at the layers that source us. For this reason we hold a lot of cognitive dissonance around that creativity when it comes to how we’ve influenced the planet. As we collectively form the intention to shift towards a higher and better calling, it is time to ask ourselves—is our highest and best calling merely to preserve the layers below? What is our creative role? What is the role that enables us to not only conserve ecological systems, but to build upon them, creating layers of abundance rather than scarcity, of complexity rather than over-simplification, and of life rather than still-life? Simply put, this is humanity’s next big shift—the shift to regenerative work. To regenerating not only ecosystems, but also our own creative capacity. Beautiful – I was just reading through the website and found your article. Absolutely beautiful. Thank you. Profound (in the fullest sense of the word) and lyrical. I’ve been thinking and saying similar things for years, but you just made it into a song. Thanks so much. Wow, elegiac. This is one of the most profound views of our world I’ve ever read. “It is about recognizing the true source of our human wealth, cultural richness, and spiritual purpose. That source is the natural world, and it always has been. In reclaiming our recognition of this source, we have taken the first step to becoming, once again after many years of having lost our way, indigenous to our places.” “Becoming indigenous to our places” is just an unbearably poignant idea and I hope, true. This feels like Aloha Aina to me…. Akin to Wendell Berry’s eloquence, this is a stimulating reading I have done for a while. Pramod Parajuli, Ph.D.
2. Humans were shaping landscapes long before the advent of permanent settlement. Hence, Tuolumne Meadows, for example rely on deliberate burns by native Americans to stimulate fresh herb and grass growth which, in turn, attracted prey species. Permaculture teaches humans do not have a creative capacity, that we can only rearrange the pieces. Of course, as has been my experience interacting with the regenerative true believers, they think their way is the one and only true ecological response. Thank you. This is insightful and sends a message of hope. Just wanted to point out that where I live, many poor communities in the rural areas are rich in greenery and wildlife. Unfortunately, they are labeled ‘undeveloped’ and so long for the ‘concrete’ of alleged ‘development’. The picture is a complex one. In nature, edge is where neighboring ecosystems meet. This is where the "edge effect" occurs—a place of diversity and abundance, adaptation and exchange. The edge:REGENERATE blog is place to explore what's happening at the edge between human intention and nature's intelligence. It's about the future of sustainability, the relevance of ecological thinking, and the need to develop not only our environments, but also ourselves.